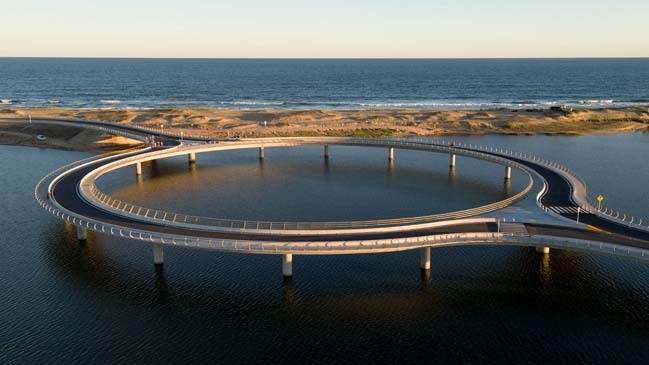 Designed by Viñoly, the Laguna Garzón Bridge has an unusual circular road deck slow traffic that allows drivers, pedestrians and cyclists to appreciate panoramic views to one of the most beautiful and pristine coastal landscapes in Uruguay. 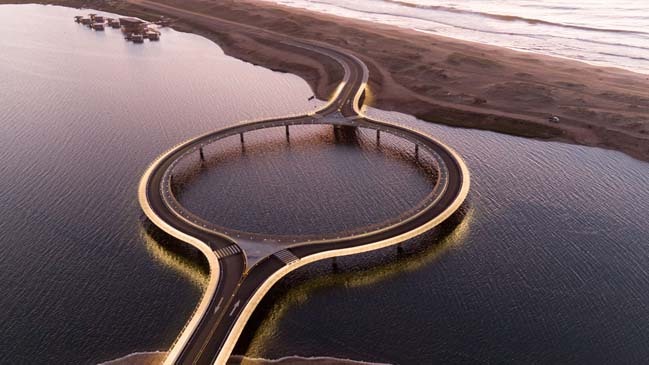 Project's description: The Garzón Lagoon is one of a series of environmentally sensitive bodies of water along Uruguay’s coast. 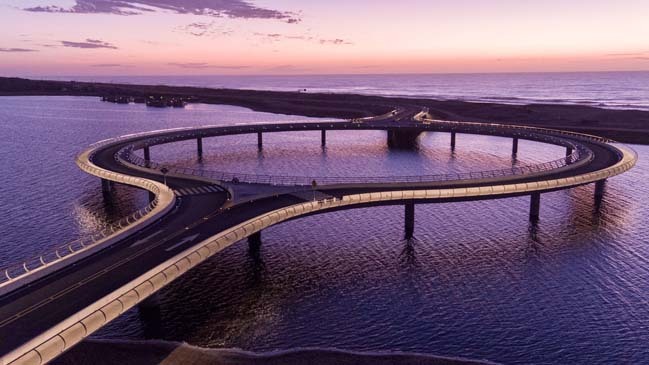 The Ministry of Transport has long held interest in developing a bridge over the 4,448-acre lagoon, where it meets the coast and divides National Route 10. Crossing the lagoon previously was only possible in the summer months via rafts. 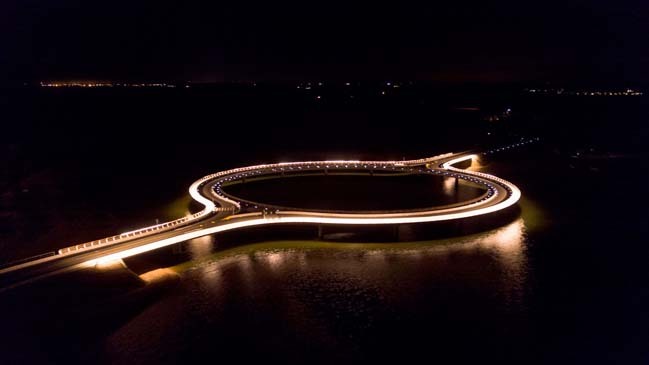 Viñoly’s design was chosen for its alternative solution to a typical bridge structure–a 202-meter (663-foot) ring of road that sits over but does not disturb the transparent water and ecosystem, slows traffic inherently, and creates a pedestrian-friendly point of interest. 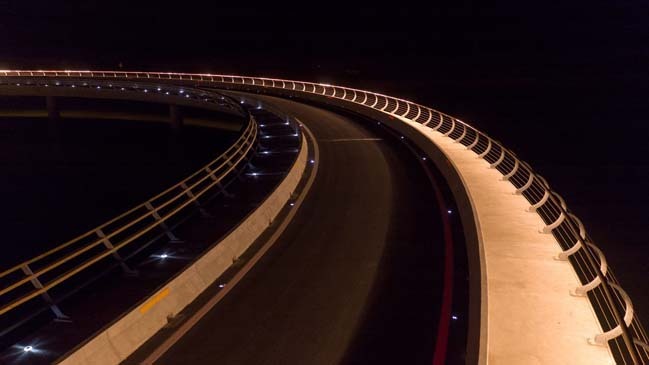 Opened in December 2015, the bridge’s 16 round concrete pillars, placed 20 meters (65 feet) apart, support two ramps and a central rotunda road across the lagoon. Pedestrian walkways on either side of the split traffic lanes give access to the structure’s central void, where visitors can sit, fish, and bathe in the water below. Tall enough for boats to pass freely underneath and designed with the fewest number of pillars to avoid interference with the natural movement of fish, the bridge was carefully designed to be least destructive to its existing ecosystem. 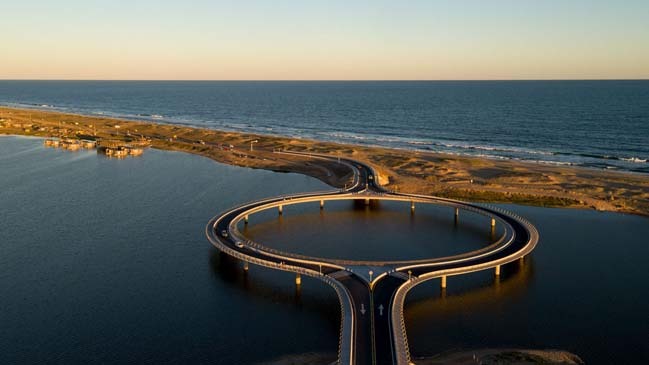 Designed as a “lagoon within a lagoon,” the circular shape reduces shadows on the water below. The structural profile also forces motor vehicles to slow while crossing and encourages drivers to take in the natural beauty of the area. Documented as an Important Bird and Biodiversity Area, a natural ecosystem that protects regional birds and their habitats, the Laguna Garzón Bridge site is popular for birdwatching and clam harvesting, and is surrounded by panoramic landscape views. 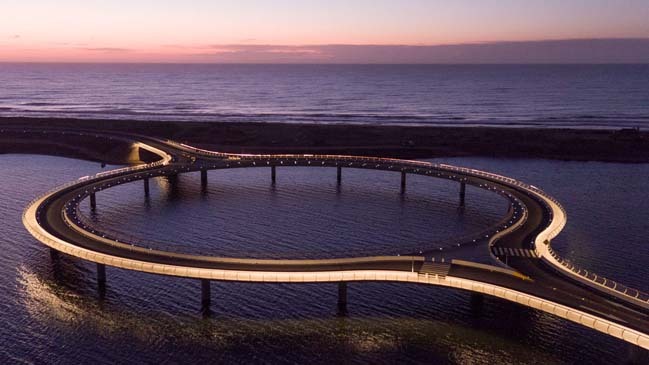 The design of the bridge minimizes its environmental impact and creates an above-water public realm.